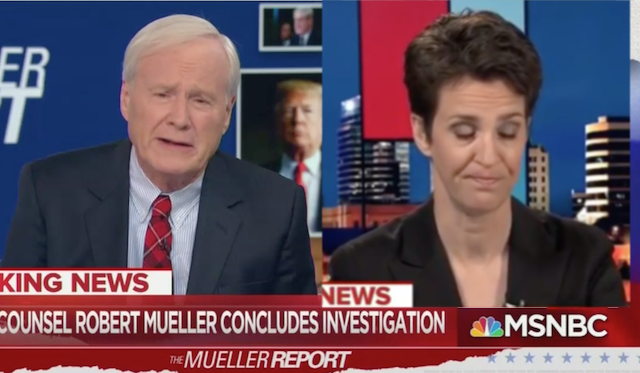 Leftists over at MSNBC for two years have been confident the Mueller investigation would deliver evidence to indict and impeach Pres Trump. And then news broke, following the Trump-Russia report being turned over to the DOJ, Mueller would NOT be recommending anymore indictments, thus the probe is over. Next up was Rachel Maddow who got choked up after all her dreams were smashed and every bit of her program over the last two years turned out to be what we’ve known them to be as conspiracist drivel..
Granted we don’t know what’s in the report, the fact there are no indictments, and those who have been indicted/ convicted are the result of process crimes, we should expect more tears and meltdowns from the media who helped the democrat party with this attempted to coup. These people have zero credibility at this point and will become quite desperate with their broadcasts so expect the rhetoric to get worse! For the time being enjoy the liberal tears flowing as the dems prepare phase 2 of their attack against POTUS. The congressional investigations will not be hindered and Mueller, their failed savior, will now be put in the hot-seat, treated like the enemy.